(Leah Hogsten | Tribune file photo) l-r Gov. Gary R. Herbert, Salt Lake City Mayor Jackie Biskupski and Senate President Wayne Niederhauser celebrate with members of the Olympic/Paralympic Exploratory Committee after signing SCR9. The Salt Lake Olympic Exploratory Committee voted on Feb. 7, 2018, to recommend that Utah should pursue hosting the Olympic and Paralympic Winter Games in 2030. Salt Lake City isn’t done pushing for changes to a new law that will create an inland port authority in charge of thousands of acres in the city’s undeveloped northwest area. But the governor appears to be, at least for now. Gov. 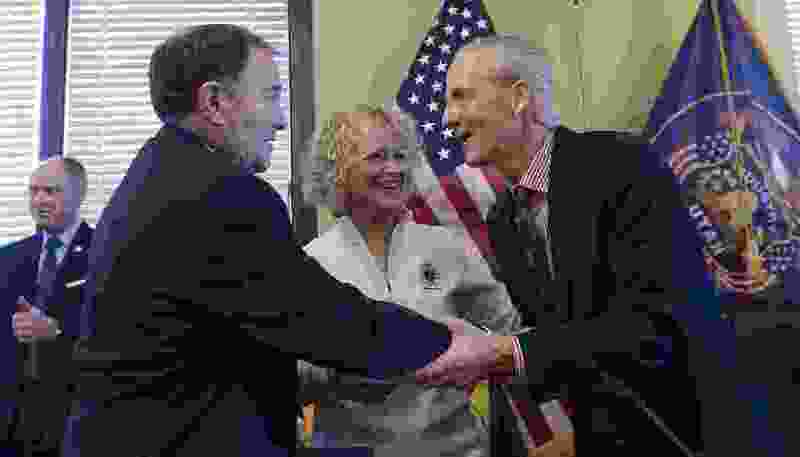 Gary Herbert had been angling to call the Legislature into special session this week to address the city’s concerns over the bill, which lawmakers radically changed and passed at breakneck speed in the final days of the legislative session. Herbert worked with the city and legislators who were at the center of the bill on a compromise that focused on four areas of concern for Mayor Jackie Biskupski and others who weren’t in the room when the final bill was written before it passed around 10 p.m. the night before the session ended. Lawmakers prepared for the special session call that never came, as City Council members and the mayor rejected the version of the bill that resulted from two months of talks, according to interviews with those involved. The dispute throws into question if and when the city’s concerns could be addressed. “We regret that these negotiations produced neither an acceptable compromise nor the needed consensus to convene a special session,” said Paul Edwards, a Herbert spokesman. The groups were hashing out an agreement they hoped could earn the city’s blessing before Herbert called legislators into session ahead of a June 1 deadline for creation of the port authority board. The governor typically tries to piggyback special sessions on days when legislators meet and hold monthly interim meetings at the Capitol, which took place this week, and some lawmakers said they anticipated a session would be called. “My understanding is they thought they had a deal, the governor presented a draft version of the bill to Mayor Biskupski, and Mayor Biskupski called him up and told him why it wouldn’t work,” said House Minority Leader Brian King, D-Salt Lake City. City officials said the version of a draft bill that hasn’t been released didn’t address its concerns with tax-and-spending power and the appeals process for land-use decisions. David Litvack, Biskupski’s deputy chief of staff and her lead staffer on the inland port negotiations, said the new law takes final land-use control away from the city and leaves it up to an appeal panel created by the port authority whose ultimate goal is economic development. That would cut the city out of decisions such as what materials may be stored on site and what’s moving through the port. It would also be a departure from the way appeals are typically handled, Litvack said. The “green” reference is aimed at any hazardous materials stored on site or other products the city doesn’t want within its boundaries. “The city is concerned about long-term storage of products that could compromise air quality or compromise the environment,” Litvack said. House Speaker Greg Hughes, R-Draper, said the disagreement comes down to the city’s desire to control development of the port, which will be an international trading hub. What Hughes says is too much control over the port by Salt Lake City could also lead to political fighting over whether the region becomes an area for shipping coal. Such a fight recently played out in Oakland, Calif., which tried to ban the shipment of coal through its coastal deep-water port before a federal judge struck down the ban. “You saw the city of Oakland was exercising some of that in the port, deciding whether or not fossil fuels were going to be a part of it,” he said. Meanwhile, City Council Chairwoman Erin Mendenhall said she’s worked with Stevenson on similar changes. The council appears to share the same concerns as the mayor, and Mendenhall said if these weren’t addressed it would put the port at risk of a lawsuit — say from one of the taxing entities affected (including the city) or an environmental group — challenging the constitutionality of the new entity, its power and its boundaries. Stevenson expressed regret over the way the House substantially changed the bill, passed it and sent it to the Senate where lawmakers quickly approved it, without public discussion or debate, with time running out on the legislative session last March. He said he’s taken a back seat in the talks since and the main players are in the governor’s and mayor’s offices. It’s “reasonable” to expect any agreement would be dealt with during an interim session, he said. The next one is June 20. First, though, there’s the matter of “the agreement you have to come to,” Stevenson said.